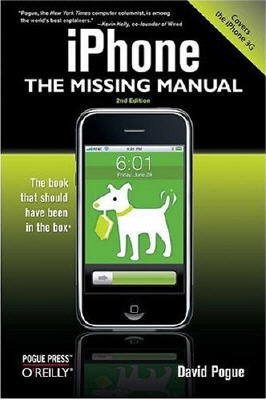 David Pogue, "iPhone: The Missing Manual: Covers the iPhone 3G, 2nd edition"
The new iPhone 3G is here, and New York Times tech columnist David Pogue is on top of it with a thoroughly updated edition of iPhone: The Missing Manual. With its faster downloads, touch-screen iPod, and best-ever mobile Web browser, the new affordable iPhone is packed with possibilities. But without an objective guide like this one, you'll never unlock all it can do for you. In this new edition, there are new chapters on the App Store, with special troubleshooting and sycning issues with iTunes; Apple's new MobileMe service, and what it means to the iPhone; and Microsoft Exchange ActiveSync compatibility. Each custom designed page in iPhone: The Missing Manual helps you accomplish specific tasks with complete step-by-step instructions for everything from scheduling to web browsing to watching videos.